UPDATE: Heavenly Springs Book Giveaway! You are here: Home / Book Giveaway / UPDATE: Heavenly Springs Book Giveaway! UPDATE: The Heavenly Springs Book Giveaway just got better! Due to the number of entries, we have decided to increase everyone’s chances by adding a second and third place. So, now the contest looks like this: One Grand Prize winner will still receive 1 copy of “Heaven Taken by Storm”, 1 copy of “The Fight of Faith Crowned”, plus a special surprise! The second place winner will receive a copy of “Heaven Taken by Storm”. The third place winner will receive a copy of “The Fight of Faith Crowned”. The winners will be announced on Saturday, January 15th. To kick off the New Year, Heavenly Springs will be giving away 2 Thomas Watson books, plus 1 surprise! 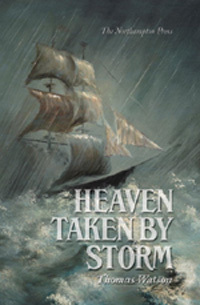 The first book, “Heaven Taken by Storm” is an old Puritan classic that has been out of print for some time now. Thanks to the editing work of Don Kistler it has been made available once more. In this handbook, Watson teaches the Christian how to employ the various means of grace such as the Word of God, prayer, meditation, self-examination, and others, to take the kingdom of heaven by holy violence. You can read about it here. The second book, “The Fight of Faith Crowned” contains 6 sermons that have not been reprinted for over 300 years. 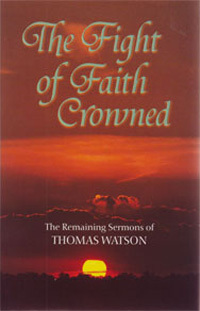 With this publicaton, all of Watson’s sermons are officially available in print! If for nothing else, the last sermon should pique your interest. Joel Beeke & Randall J. Pederson, in “Meet the Puritans” describe how, “The last sermon strips away every excuse for not seeking God and pleads that we bow to the demand of the gospel.” You can read all about it here. So, just to be clear. One winner. Two books. One special surprise. Sounds like a good deal to me! If you are interested in entering the contest, all you have to do is leave a comment to let me know. Also, if you would like to increase your chances, post this to your FB profile, or your blog and then let me know that you have done so. I will add your name to the drawing for each time you share! The winner will be announced next Saturday, January 15th. Click here to read an excerpt from Meet the Puritans by Dr. Joel Beeke and Randall J. Pederson in which they provide a biography, and also brief discussions of each of his works. How fun! Count me in 🙂 I’m posting this on my FB and in my blog as well! Hi Christina! OK, no need to enter my name (I’ve got a ton of books I’m working through and others should be as blessed!) but I think it’s neat you’re doing this. I’m about to do a book giveaway on my site too. OK, readers, if you don’t take Christina up on her Thomas Watson books, tu es muy loco! TW is a wonderful addition to any believer’s library! What a nice thing you’re doing! Oh, I forgot, I shared it on Fb! I will post this on fb and my blog. I will post it on my blog, as much as I would love to win I have about 12 books I am working on now. What a wonderful idea Christina! God bless! Oh, please enter me, Christina! Not only do I read the KJV, but I also don’t do Facebook. May I have another entry just for lovin’ you so much? But, then you’d have to give everyone another entry. I will announce it on my blog, though. 🙂 Love and hugs! Count me in too! 🙂 I also shared on Face Book! Enter me in. I gave 97.2% of my books away before I left the USA. I have a box full here. Could use more reading material and TW is one of my favorites. I brought to Kuwait the “Body of Divinity” because I consider it a must in a Calvinists library. Whoever God chooses for this will be much pleased!…and I do have an American address – so no worry. You can ponder the giveaway as you watch it snow there……..ho, ho, ho…. Count me in. Once for the comment, once for posting on facebook. Thanks! The Puritans! I would love to win this wonderful giveaway! Can’t remember the last time I won something! Please toss my name in the hat. Thanks. Please enter me too Christina! Interesting idea. The books seem interesting. Though I still have so many good ones at one, not read yet. But I am reading. I love the Puritans, so please count me in! Just posted on my blog about your giveaway. Thanks!!! Would definitely love receiving these books. What a nice give-away. I posted this on FB as well! Thanks! Please enter my name. I also posting on Facebook. Thank you. I also shared on Facebook. Thanks for having this giveaway! First time visit to your website will enjoy having a wander. Please count me in, in your giveaway. Appreciate your posting and sharing. I’d love to have the opportunity to win. How totally awesome! Thank you Norma for sharing and please consider this my entry! Wonderful! Thank you for the opportunity to read these books. I’d love to be entered. hey sis!! I am in! I entered on FB, too. Please enter! How blessed I am to have you AND your sister visiting my blog! Norma, it is a pleasure to meet you! You sister Becky is precious to me, too! So generous!! Let the drums roll…. Thank you so much for the opportunity to enter this giveaway. I would love to read anyone of these books.